Antique fine jewellery, unusual or rare gemstones, small items of silver for the table, desk or dressing table, needlework samplers, and collectibles. Associate Member of the Gemmological Association and Gem Testing Laboratory of Great Britain, and of the Society of Jewellery Historians. Unlike most dealers in vintage and antique fine jewellery, heavy investment has been made in training and expensive equipment. ALL jewellery items have been FULLY tested (both stones and metals) and are guaranteed to be accurately described. or by email at patriciantiques@aol.com. Victorian 9ct rose gold bar brooch set with a vibrant rhodolite garnet. 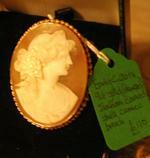 Early C20th Italian shell cameo, beautifully carved, set in a 9ct gold (stamped) brooch mount. Edwardian 9ct gold (not marked, but Mizar tested) bar brooch, set with a finely carved Italian shell cameo and natural (not cultured) seed pearls. O.33cts of lively diamonds (stamped "DIA" ".33") channel set in this fully hallmarked 9ct yellow gold wishbone ring. Blue topaz and diamond (stones tested) pendant set in fully hallmarked 9ct yellow and white gold. Victorian 9ct (stamped) brooch set with a large natural amethyst (tested) of excellent colour, with the later addition of a rollover safety catch. 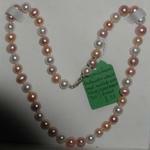 17-inch (43 cms) strand of lustrous 8-9mm round cultured freshwater pearls in toning shades of pale peach, blush-pink, rose and mauve, with a silver (stamped "925") clasp. Beautifully boxed, ready to give. 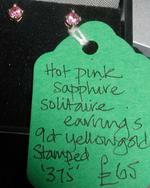 9ct yellow gold (stamped "375") hot pink sapphire solitaire stud earrings for pierced ears, boxed. 0.25 carats of lively diamonds set in two rows, fully hallmarked 9ct white gold ring. Half a carat of diamonds set in a daisy cluster ring, fully hallmarked 18ct gold. 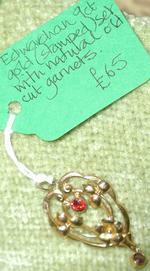 Edwardian 9ct (no marks, but Mizar tested) yellow gold quatrefoil pendant set with two fiery natural (tested) gernets. 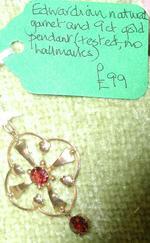 Delicate pink oval faceted rose quartz stone set in a polished contemporary 9ct pendant, fully hallmarked. Contemporary 9ct yellow gold bar pendant set with a square-cut natural (tested) blue sapphire of 0.10 carats. Edwardian 9ct (stamped) rose gold pendant in the form of a foliate quatrefoil frame with gold ball drop, the pendant centrally set with a bright natural (tested) rhodolite garnet. With shaped bale. 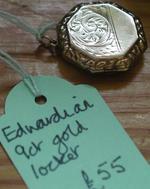 Edwardian 9ct gold locket of hexagonal form with engraved border and foliate-patterned front panel. Large silver-gilt (fully hallmarked silver with a gold wash) locket with floral engraving to front panel. Edwardian 18ct (stamped) rosy gold ring set with five graduated, early brilliant-cut natural diamonds (tested) to a total weight of around 0.3 carats. Circa 1925. Natural diamonds (tested) set in a contemporary flower cluster, 0.33 carats approx, set in hallmarked white gold. Vintage 9ct yellow gold curb bracelet, fully hallmarked for Sheffield 1980, 6.5 grams. Forty inches (102 cms) of natural, undyed celadon-coloured Chinese jade beads, threaded onto apple-green silk with oriental knot fastening. Description Vintage twist ring set with two large, lustrous cultured pearls, the shoulders set with natural rubies. Mizar-tested as 9ct gold.